I do Bear storytime every fall – my bear puppet’s getting ready to hibernate so we read him some bedtime stories. 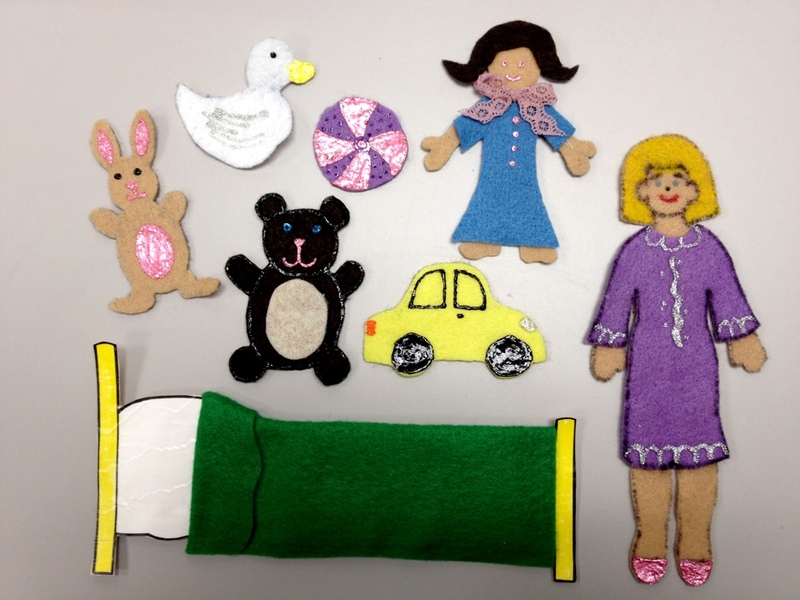 The song “Ten In the Bed” (or 5, in this case) is a staple for my bedtime stories theme, but also works great for this storytime. I had a flannelboard already made up for this one, but it was looking pretty sad and careworn, so I decided to re-do it. 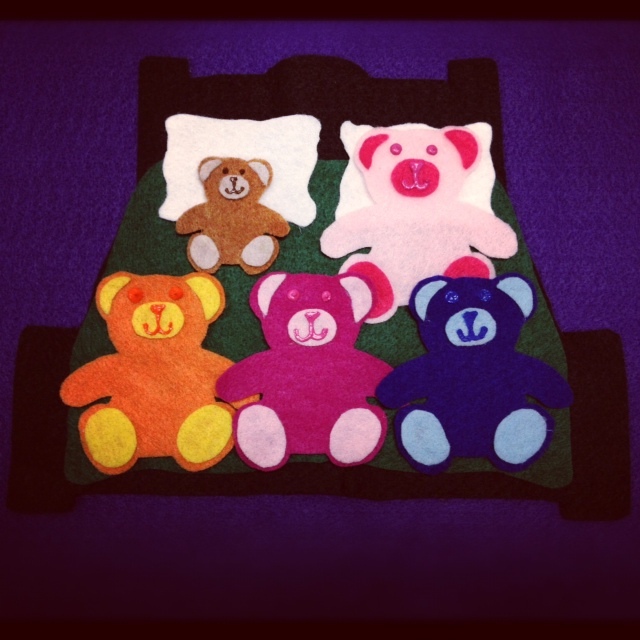 4 bears in the bed… etc. The kids especially enjoy if, when a bear falls out, he actually flies through the air and lands on the floor. Flying felt is ALWAYS a hit. 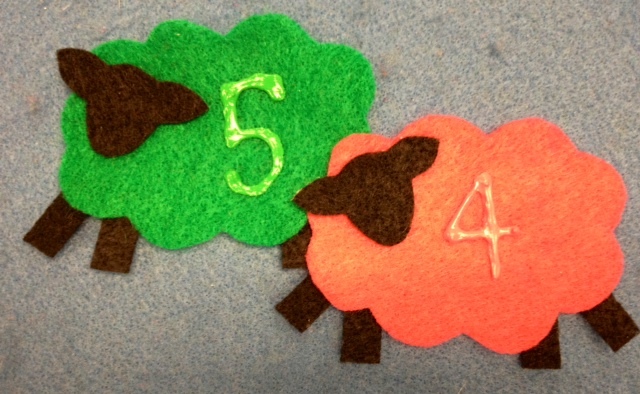 I got the bed pattern from Making Learning Fun. The bears are a result of a clipart search for a pattern. Today’s roundup will be hosted by Anna, our Future Librarian Superhero! And click the icon to the right to see all past flannels, organized visually by categories. SNOOOORRE! Bedtime Stories Make Me Sleepy. Stein, David Ezra. 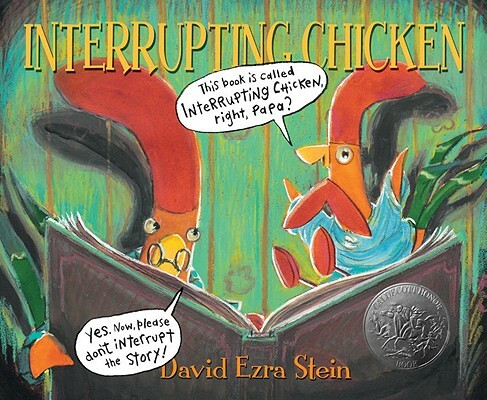 Interrupting Chicken. Oh, how I love this book. Little Red Chicken is supposed to be relaxing and falling asleep while Papa reads her a story, but she can’t help…interrupting. Great way to introduce this new word! Yolen, Jane. How Do Dinosaurs Say Goodnight/¿Cómo dan las buenas noches los dinosaurios? A new classic. And you get to fake cry! Bonus! Dewdney, Anna. Llama Llama Red Pajama/La llama Llama rojo pijama. I love it when great stories like this are translated into another language AND it still rhymes AND the story hasn’t changed much. Occasionally the English and Spanish versions of a story will be completely different! Not here. The story of little Llama’s bedtime drama is the same. Fingerplay (or fingerpuppets or flannelboard): 5 Little Monkeys Jumping on the Bed! Here’s a printable flannelboard or magnet version. Root, Phyllis. Creak! Said the Bed. Mama lets everyone into the bed on a cold, blustery night. Dad says no to letting one more family member in, but he jumps in anyway – to disastrous results. Bardhan, Sudipta. Chicks Run Wild! Mama wants her chicks to go to bed. But when she leaves the room, they run WILD! Chaconas, Dori. Can’t Sleep Without Sheep! Ava needs the sheep to keep jumping the fence in order to fall asleep. But when they quit the job, can any other animal replace them? Fore, S.J. Tiger Can’t Sleep. The boy can’t sleep because there’s a tiger in his closet…eating potato chips! Boy implores Tiger to be quiet as tiger continues to engage in all kinds of noisy activities. Wood, Audrey. Napping House/La casa adormecida. 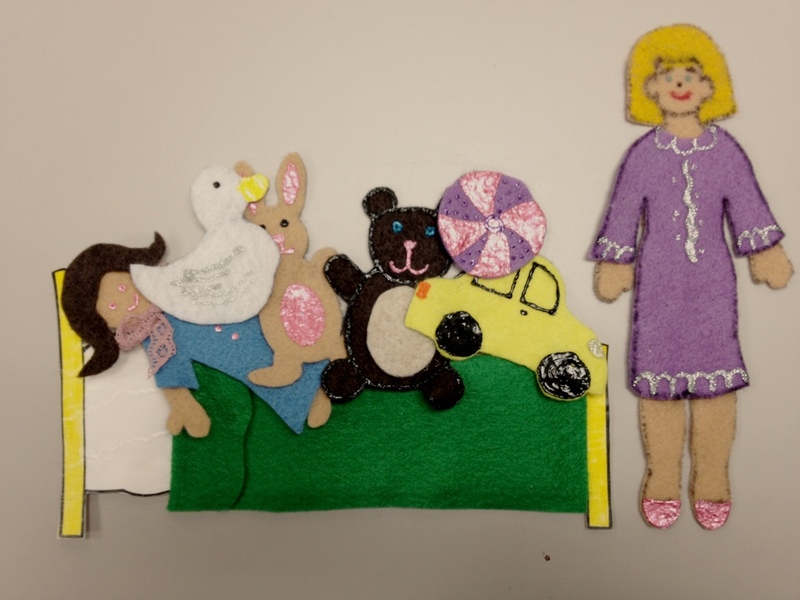 A fun cumulative tale with lots of sleep-related vocabulary. Wilson, Karma. Bear Snores On. On a cold night, the animals gather in bear’s cave and have a party. But bear misses it – he’s too busy snoring! Martin jr., Bill. Kitty Cat, Kitty Cat, Are You Going to Bed? A rhyming story about kitty’s activities at bedtime. Weeks, Sarah. Counting Ovejas. 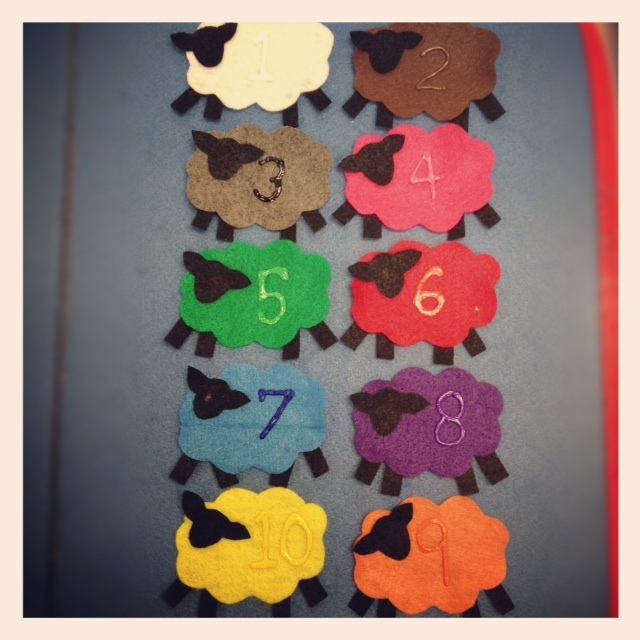 A bilingual story of a boy counting colorful sheep. A lovely concept book! *Yawn* I think I need a nap now. Read me a bedtime story? A quick FF post for y’all today. I still haven’t finished my new flannel, but I found this one in my files (I had forgotten all about it) and thought I would share. It’s a slightly changed version of the story Lisa Can’t Sleep by Kaj Beckman. I think the book is out-of-print, but I was able to find one via ILL. Finally Lisa says she can’t sleep because there’s no room for her in the bed (I let the kids guess this part). She chooses one item, her doll, and finally goes to bed. Here are all the items I made (not all of them appear in the book). I freehanded everything, and it shows a bit, I think. The bed is a graphic made in MS Word, then attached to manila folder and covered in contact paper. 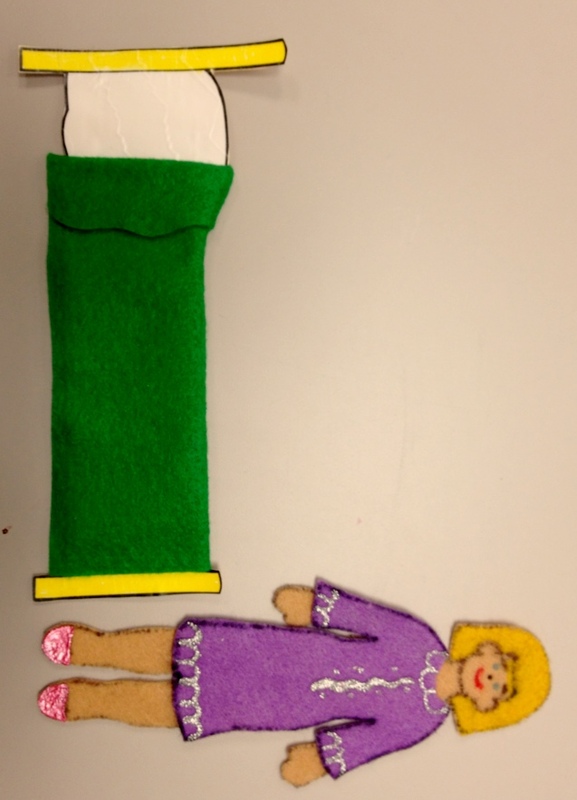 I added a felt bedspread to give it some shape and texture. There it is! Enjoy! And doesn’t Lisa have lovely slippers? The lovely Anne over at So Tomorrow (one of the original Flannel Friday-ers) is hosting today’s round-up. Or click the “Flannel Friday” link to the right to see all the flannels of the past (sounds ghostly…ooooohhh!) organized in visual form on Pinterest.